ClixSense can be a great platform for making some extra cash. An important aspect is of course then how you can get the money you make paid out. There are currently 5 ClixSense Payout Methods, and they have different advantages and possibilities. They are all are free to sign up for, and can all be good options, but it can be difficult to figure out exactly which option is the best for you. As ClixSense is one of my favourite survey sites, and one of the sites I have had the most success with, I have spent a lot of time trying to get an overview of the different payout methods and find out what the advantages and disadvantages of each of them are. In this article, I will share this information with you, so it will be easier for you to get an overview in one place, so you do not have to jump in between the sites to compare and try to find the information. It is important to be aware that the sites can update their conditions anytime, and therefore you should also check the newest conditions on the sites themselves, when you have found the one that is the best option for you in the overview below. Also, be aware that the fees I give below are examples. There can be different fees depending on the country you live in, or there can for example also be a currency exchange fee that depends on the currency in your country. The below is meant to give you a good overview, but it has not been possible to include all the exact fees for every single country as that would be a too long and boring article. Instead use the overview to get a good idea, and then check out your chosen site for the exact conditions for your country. Let’s first start with an overview of the payout options ClixSense offers. There are 6 ways to get paid and there are different fees depending on the option you choose. You can see the fees on the chart below. This chart shows the payout fees and the thresholds for the payout methods ClixSense offers. These are fees to payout from your ClixSense account to the chosen method. Be aware that each of these companies might have different fees for you to withdraw the money to your bank account or however else you wish to withdraw your money. So do not just choose the cheapest option on this list, as it is just fees to get your money out of ClixSense and does not give the full picture. Below I have given an overview of the different payout options, and included the basic options and fees each of them have, so you can get a better picture. Payoneer is one of the online payment service that ClixSense offers to pay out to. It offers its services in over 200 countries and in 80 currencies. There is a $2 fee to get you ClixSense rewards to your Payoneer account, but that is a flat rate, so it will be the same no matter how much your transfer. So if you transfer bigger amounts, it is not a big fee, but if you do not have a lot of income on ClixSense or if you prefer transferring often but smaller amounts, it can be a bit expensive to get your rewards through Payoneer. On the other hand, if you can wait to withdraw your money from ClixSense until you have for example around $100, Payoneer is in my opinion one of the best and cheapest solutions – especially because you can also get a very good joining bonus (see more below). Once you have your rewards in you Payoneer account, you can get them out by withdrawing to your bank account or order a prepaid Payoneer Mastercard. If you transfer to a bank account in a different currency, the fee will be up to 2% above mid-market rate, and if you transfer to a bank account in the same currency (if it is Euro, USD, GBP) it will be $1.5, £1.5 or €1.5. On Payoneer’s website you can see the exact costs for your country, and see if it supports your local currency. It is fast to sign up, but compared to some of the other options on this site, there are a few more steps you need, as they are going to verify your identification and bank details already when you sign up. This is not a bad thing, but just because the platform are verifying you before you sign up, whereas some of the other options, it only takes 1 minute to initially sign up, but then you need to verify your identity later. At Payoneer all that is taken care of in the sign up process. If you want to know more details about this payment platform, I have made a full report/review of Payoneer you can check out. Get $25 dollars for free on Payoneer! Payoneer has the added bonus that the site offers a bonus, if you join through a special invitation link. As I am already a member and user of Payoneer, I have been able to get such a link. So if you join through the link below, you will get $25 on your account for free (you will receive the bonus once you have received or uploaded $1000 to your Payoneer account). Skrill is offering you to receive your ClixSense payments as cash into a Skrill online account. It offers accounts in 40 different currencies. You can then from here withdraw the money into your bank account, into your visa card or get a prepaid visa card with the money from your Skrill account. You can also use your Skrill account to pay merchants, and it is especially used at many online casinos, betting sites, binary option sites, and forex sites. To get your money from ClixSense to Skrill only cost 1% and as with most of the other options, you can withdraw them from ClixSense as soon you have $10 in your ClixSense account. The fees to then get or use your money from there, depends where in the world you live, and how you want to get your money. Some examples are that bank withdrawals are around €5.5 per withdrawal. To withdraw money from with your visa or debit card cost 7.5%. There can be extra costs involved in relation to currency exchange. You can also order a prepaid Mastercard with the funds from your account. This is free to use in shops or online, but has a 10 euro yearly fee for the card itself. The above are just examples, and you need to check the exact costs for you on the website. I have also made an article with a full report about Skrill that you can check out for further information. It is free to get a Skrill account and free to have it as long as you login or do a least 1 transfer every 12 months. If not, there will be a 3 euro fee deducted every month from your account, so just remember to at least login once in a while, if you use Skrill. In my opinion, Skrill can be a good option to get your money from ClixSense. But it depends how much money you are making and how you want to spend them. If you want them to your bank account, you need to wait until you have a substantial amount, as it will be too expensive to withdraw small amounts often. But it is great with the opportunity to get them to your bank account. Tango card is pretty simple to use. This service offers a number of different ways you get your rewards. You can get it on a virtual visa, prepaid visa card, get a number of different vouchers or donate to charity. The site is however mostly optimized for people in the US or Canada, so most options are available, if you live in one of these countries. There are however also other countries, where you can get vouchers – So if you live in Australia, Brazil, Canada, Japan, China, France, Spain, Italy, Germany, and the UK there are also a number of vouchers you can chose from. To most other countries you have to get your money to a virtual visa card or as bitcoins. Tango Card can in my opinion be a good and easy option. In most cases, there will be no fees to use this option, so if you like one of the options that Tango Card offers, it can be worth going for. In my case, I prefer an option where I can also get the money to my bank account, which Tango does not offer, but if I had lived in the US or Canada, I would probably have considered one of the options Tango offers. Dwolla is an option that is only available for US members. It is a way for you to get your rewards send directly to your US bank account. It is a lot quicker than getting checks (more about this option below), and there are no fees associated with using Dwolla. ClixSense is working on making this option available for other countries than the US as well, and personally I hope they will soon make this happen, as it seems like an easy option. You do not need to sign up for Dwolla to use this option. You just fill out a form when you request your payout from ClixSense, and once it has been processed, you will receive an email from Dwolla with the instructions. I cannot say for sure what these instructions are, as I do not live in the US myself. To use this option, you need to provide US checking account info. But if you live in the US, this could definitely be a ClixSense payout option worth considering. If you live in the US or Canada, you can chose to get your money paid out through check. This can be an easy and convenient way, if you like this kind of payment. However, it is only possible if you live in the US or Canada. If you (like me) are from a different part of the world, you have to go for one of the other options. It costs $1 to withdraw your money from ClixSense on a check. The first time you do it, it is free. Be aware that your bank might charge you an extra fee for depositing the check, so better to check with your bank beore using this option. so you do not get any unpleasant surprises. 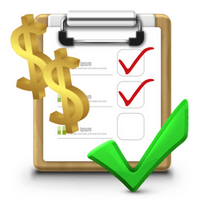 The above gives you a description of each of the payout options ClixSense offers. But what is probably important to many (including myself) is not only the options the different methods offer, but especially what the fees are. Personally, I have especially been looking for the fees in relation to withdrawing the money to my own bank account or credit/debit card, as I prefer to have this option in the long run. I have mentioned these fees in the descriptions above as well, but below you can find an overview of them together. In the chart below, I have not included the fees for prepaid visa/mastercards, but you can find this information in the descriptions above or on the websites themselves. As you can see, there are plenty of good options to get your ClixSense rewards paid out. I cannot say that one method is better than another. It really depends on a number of different things. For example the amounts you earn on ClixSense, where in the world you live, and how you prefer to get your rewards. So I hope the above has given you a good idea about what the different methods offer, and now have a better idea which one you prefer. If you have any questions, or if you have any experiences with any of the platform, I would love to hear from you in a comment below. 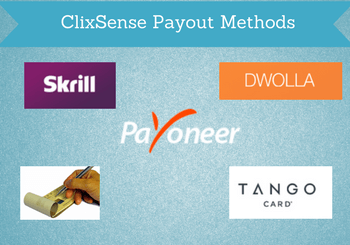 Thank you for this overview of the many options for withdrawing money from Clixsense. I guess you have a bank account, right? Because both Payoneer and Skrill pay out to your local bank account. Just make sure to check what they offer for your specific country. Hope this helps and let me know if you have more quaetions. What I meant was that I am assuming that your MasterCard is connected to your bank account? If it is, then you can withdraw the cash from Payoneer or Skrill into your bank account and then use the funds through your MasterCard. None of the two options offer to pay directly into your MasterCard. On both sites, you can, however, get your money on a prepaid MasterCard. You can read more about exactly how this option work on the websites of the two platforms. I am personally mostly using Payoneer. This works great and once you withdraw your money to your Payoneer account, it is easy to transfer them to you local bank account. Skrill can however also be a great and easy option. Very informative article on Clixsense payout methods. Since I have a Clixsense account it is especially interesting for me and I will be looking at all of these options to see which one works best. Since I live in Canada it seems like getting paid by check will be a good way to start. Glad you liked the info. Yes check can definitely be a good option if you live in one of the few countries where that is an option. And now you then also now more about the other options in case you wanna give one of them a try as well. Yes Skrill is based in the UK. I have also heard some complaints about it, but have not had any problems myself. It is also authorized by the Financial Conduct Authority (FCA) in the UK, and is used by companies like Skype and e-bay, so that gives it some trustfactor in my eyes. You could also try to transfer just half of your amount on your ClixSense account to check have it works for you. Just be aware that there is a set fee for transferring from Skrill to your bank account, so it is quite expensive if you only transfer a small amount. But you can also use the option of transferring to your credit/debit card which is a percentage and therefore a cheaper option for smaller amounts. You can also wait until you have a bit more cash on your ClixSense account and then use Payoneer. You have to have a minimum of $20 before you can cash out to this. And this option is also better with amounts that are a better higher as it is a bit expensive to withdraw smaller amounts from ClixSense because there is a set fee of $2 no matter the amount you cash out. But other than that, Payoneer can be a great option, and also offer the joining bonus you can read about above. Those two I would say are the best options to transfer money into your bank account from the UK. If you would consider gift cards, TangoCard could also be an option. It offers some decent options for the UK. Like for example gift cards to Tesco, Amazon, Starbucks and more. It also offers a prepaid Mastercard in GBP. Hope this helps a bit. And let me know if you have any more questions. Do you mean you have a lot of earnings in your ClixSense account? If this is the case, you go to your ClixSense dashboard. Next to where you can see your balance, there is a small button called “cashout”. Click this button, and you will then be able to choose how you want your money. Be aware that you need to have an account on Payoneer or Skrill first, if you want to use one of these methods. You can click the links in the article above to go to their websites and create a free account. I just want to know if you think these payment methods especially Payoneer and Skrill are indeed good enough? I do not look forward to being hacked and just wish for my earnings to be delivered safely. I am Namibian from southern Africa by the way. Yes, definitely think these payment methods are good enough. Personally, I mostly use Payoneer and I have been paid many times by ClixSense through this method and it has worked perfectly every time. And I have easily then been able to transfer my money from my Payoneer account into my bank account. Hi Mikael! Really interesting article you’ve got here about clixsense paying methods! I have actually considered using clixsense for my website. My biggest concern of using ad programs is not being able to get the money paid out because of certain limitations and regulations. But after reading this, I feel that I should give clixsense and try it as the payment methods seem to work out for me! Great to hear that my article cleared up some things for you. Good luck with ClixSense, and let me know if you get any questions. Thank you for writing this article on ClixSense Payout methods. It was very informational and helped me to get a good idea which payment method I would choose if I were actively using ClixSense. I haven’t actually done anything with that site at this point, though I was somewhat aware of it. Now that I know more, I am more likely to try it out. So thanks again! Glad I could help Christopher. It is nice that ClixSense offers all these payment methods. But at first it can also seem quite confusing. I have had a hard time figuring out which method I should go for, so glad if I can make it easier for others with this overview. I am from Canada, so I will probably just go with check as $1 is a very small fee to pay. Keep up the good work, I can see that you have put in a lot of time and effort to create your content. And glad you appreciate the work I am doing. Always nice when somebody appreciate when you make an effort. Thanks.